Every Thursday on the EiE Blog, we bring you useful tips for teaching classroom engineering. Measuring range of motion with a goniometer. 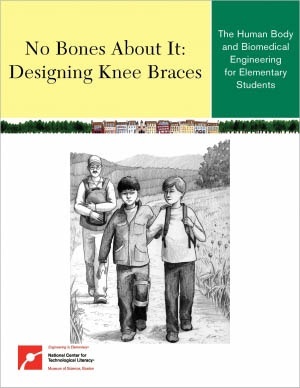 The Engineering is Elementary curriculum unit "No Bones About It" gives students a chance to apply their science knowledge to a real-world engineering challenge: designing a knee brace to support an injured knee. To do the challenge, students need a model leg with a knee that really bends! You make this model in advance using cardboard mailing tubes and a wiffle ball. Your teacher guide has detailed directions for how to do it, but if you're not the "crafty" type, you might want a little extra help. That's why we also have a short "How-to" video that breaks the task into easy-to-understand steps. Probably the most important tip we can give you is to label the leg as you go: the inside and outside, front and back, and top and bottom (upper leg/lower leg). This is where a short video really is worth a thousand words. How-to Videos make EiE lesson prep a breeze. View full-size here. If you find the "Create a Model Knee" How-to video helpful, there's more where that came from! 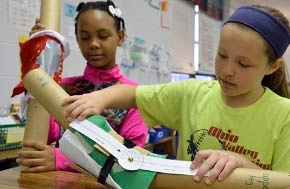 To measure the natural range of motion in the human knee (and to evaluate the success of the knee braces they design), students use a tool called a goniometer that you, the teacher, must build before the lesson starts. Don't be scared by the name. Watch the "How to Make a Goniometer" video and you'll see it's actually a simple process. This unit engages kids in a realistic biomedical engineering design challenge. To collect the data, students measure their own feet, starting by tracing the outline of their wet footprint on a piece of paper. If you're feeling concerned about a class activity that involves removing articles of clothing and spraying water around, this video will reassure you that it's a pretty simple and mess-free process. Finally, remember that in addition to How-to Videos, we offer Classroom Videos that let you peek inside an engineering classroom to see an exemplary teacher facilitating the lessons. These videos are great if you're teaching "Knee Braces" for the very first time . . . or if you just need a refresher. Do you have a Teacher Tip to share? Let us know. If we use your tip on the blog, we'll thank you by sending you the EiE Teacher Guide of your choice.